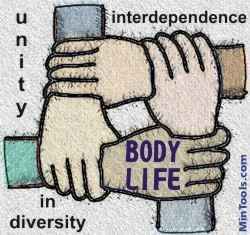 What Happens When the Church Follows God's Design for Body Life? Aren't you tired of all the petty conflicts and church splits? Only when we learn to submit to one another and truly care for one another will we see unity in the midst of all the diversity in the church. Body life produces a healthy environment in which people want to do their part, using their spiritual gifts. Ephesians 4:16 says that it is as everybody does their part that the church grows. When the church functions as a body, people gain a sense of community or belonging. This generates a commitment. People actually begin to WANT TO go to church. Clearly the results of true body life benefit the church. Why? -- Because we are living within God's design for the Body of Christ. In the busyness of life, the Christian Church needs to be called back to relationship. We need to experience anew the "one-another" commands of Scripture. We need to get back to the basic design and purposes God established for His church, the Body of Christ. Whose Responsibility is It to Foster Body Life within the Church?